The percentage of adults who read an e-book in the past year has risen to 28%, up from 23% at the end of 2012, according to the latest research from Pew Internet. At the same time, the study reveals that about seven in ten Americans reported reading a book in print, up four percentage points after a slight dip in 2012, and 14% of adults listened to an audiobook. Though e-books are rising in popularity, print remains the foundation of Americans’ reading habits. Most people who read e-books also read print books, and just 4% of readers are “e-book only.” Audiobook listeners have the most diverse reading habits overall, while fewer print readers consume books in other formats. Overall, 76% of adults read a book in some format over the previous 12 months. The typical American adult read or listened to 5 books in the past year, and the average for all adults was 12 books.1 Neither the mean nor median number of books read has changed significantly over the past few years. 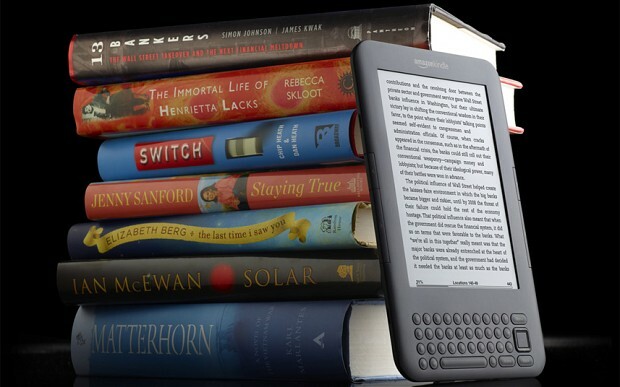 The January 2014 survey, conducted just after the 2013 holiday gift-giving season, produced evidence that e-book reading devices are spreading through the population. Some 42% of adults now own tablet computers, up from 34% in September. And the number of adults who own an e-book reading device like a Kindle or Nook reader jumped from 24% in September to 32% after the holidays. Overall, 50% of Americans now have a dedicated handheld device–either a tablet computer like an iPad, or an e-reader such as a Kindle or Nook–for reading e-content. That figure has grown from 43% of adults who had either of those devices in September. In addition, the survey found that 92% of adults have a cell phone (including the 55% of adults who have a smartphone), and 75% have a laptop or desktop computer – figures that have not changed in significantly from our pre-holiday surveys. E-book readers who own tablets or e-readers are very likely to read e-books on those devices—but those who own computers or cellphones sometimes turn to those platforms, too. And as tablet and e-reader ownership levels have risen over the past few years, these devices have become more prominent in the e-reading landscape. Concerning gender, age and education level, the study shows that women are more likely than men to have read a book in the previous 12 months, and those with higher levels of income and education are more likely to have done so as well. In addition, blacks are more likely to have read a book than Hispanics. There were no significant differences by age group for rates of reading overall. In terms of book format, women are more likely than men to have read a print book or an e-book, as are whites and blacks compared with Hispanics and those with higher education and incomes compared with others. Younger adults are also more likely than those ages 65 and older to have read e-books, as are those who live in urban and suburban areas compared with rural residents. Finally, adults with higher levels of education are more likely to have read audiobooks than those who did not attend college. Among these recent readers, young adults caught up to those in their thirties and forties in terms of overall e-reading: Almost half (47%) of those under 30 read an e-book in 2013, as did 42% of those ages 30-49. E-reading also rose among readers ages 50-64, from 23% in November 2012 to 35% in January 2014. However, the e-reading rate among readers ages 65 and older remains around 17%. These findings come from a survey conducted by Princeton Survey Research Associates International between January 2-5, 2014. The survey was conducted among a nationally representative sample of 1,005 adults ages 18 and older living in the continental United States.